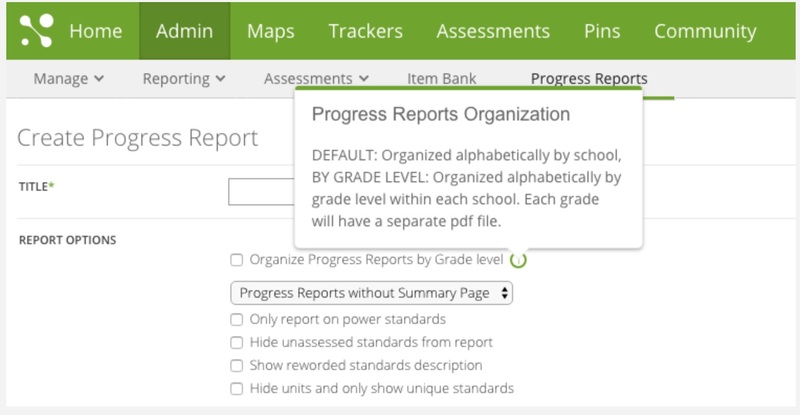 Progress Reports allows you to generate standards-based, end-of-term reports to share with parents and students. Enter a Title for your progress report. Check the box if you want to sort your reports alphabetically by grade level. The default is set to sort alphabetically by school. In the Term Labels field, you may enter a single alpha character to specify your academic term; for example, "T" for Term or "Q" for Quarter. Specify the start and end date of your first term. Use Add Term to add (up to four) terms to round out your school year. Note: Information in your progress reports is gathered from assessments given between the indicated term dates. If you're a District Administrator, the School section appears as Select Schools, allowing you to indicate which schools in your district will use this report. When you're done, click Create Progress Report to add it to your list of progress reports for the school or district. Notifications are automatically emailed to teachers, reminding them to provide comments for progress reports. For more information, please see Enter Progress Report Data. At the close of each term, click on Generate Report to start pulling assessment data from your teachers' trackers. Once the report has been generated, you will be informed via email that it's ready for download. 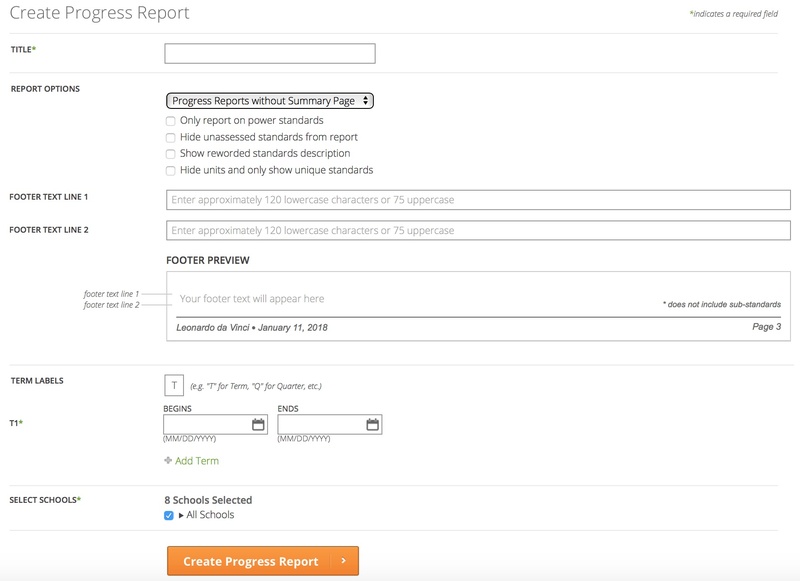 Once your progress reports are ready, you'll be able to download a PDF file to print and distribute; email parents a copy of their student's progress report directly, including a link for them to view the progress report online using MasteryConnect's Parent Login; Reopen progress reports to add new—or edit existing—teacher comments; Recapture to pull in and recalculate any last-minute data.